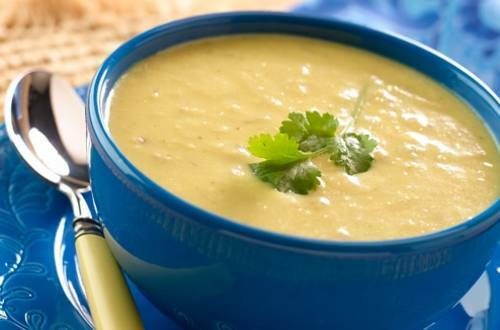 Prepare your taste buds for a spicy kick with our Cilantro Corn soup recipe, which takes corn soup up a notch. 1 Process corn, 1 cup water and Knorr® Reduced Sodium Chicken flavor Bouillon Cube(s) in blender until smooth; set aside. 2 Melt Spread in a large saucepan over medium heat and cook onion about 5 minutes or until tender, stirring occasionally. Add garlic and cook about 1 minute, stirring frequently. Stir in corn mixture, remaining 1 cup water and poblano pepper. Bring to a boil. Reduce heat and cook about 5 minutes or until heated through, stirring occasionally. Remove from heat. Stir in sour cream and Knorr® Cilantro MiniCubes.